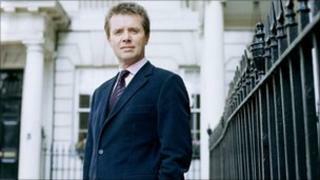 BBC presenter Nicky Campbell has revealed how he chased an intruder from his south London home while naked. The Radio 5 live host was alerted by his dog on Friday morning and gave chase after he spotted a man in his garden trying to steal his bike. Mr Campbell told listeners the man escaped empty-handed after he sped from his house. The broadcaster said he was so "pumped up" by what was happening that he just wanted to "get him". Mr Campbell and his wife Tina were alerted by their dog Maxwell barking at 0510 BST. At first, they assumed the pet had been disturbed by the noise of foxes, but he went to check. Mr Campbell, 50, said: "I went and had a look and I got up on the loo and looked out of the window, and there was a bloke in the garden trying to steal my bike. "So I bashed on the window - I was stark naked. He looked up - he was a white guy mid 20s - and I raced downstairs and adrenaline completely took over. "I would have gone into that garden and jumped on top of him stark naked. He would have needed trauma counselling for a long time. "I ran into the garden and he just disappeared over the fence with the dog following me. I was so pumped up. "It just took over me, I just wanted to get him." Despite the incident, Mr Campbell was on air less than two hours later to present the station's breakfast show. By coincidence, Mr Campbell, who won a Sony Award this week, had been leading a phone-in about burglaries on Thursday. Mr Campbell wrote on Twitter: "Just had excellent police and forensics round after my intruder incident. "Chased a man out garden at 0515 BST after hero dog Maxwell alerted us." Police confirmed they were called to reports of an attempted theft and said officers were investigating.